Have you ever played baseball, softball or just swung a bat for fun? You certainly haven’t been far away from a great golf swing. In fact, the two swings are very similar. There is just a different strike zone in golf. All we need to do is tilt and bend with our spine relative to the ground to lower the strike zone. The only difference between Fig. 1 and 3 is that I bend from my hips down relative to the turf to reach the ground and the ball. Notice the shaft and lead arm. The hips are rotating through to the target as seen in Fig. 1. The club will now release down and through the impact zone, creating a descending blow with a lot of effortless power. 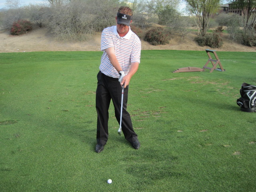 The fist few times you do this you may experience thin shots because your used to coming up with your spine angle. 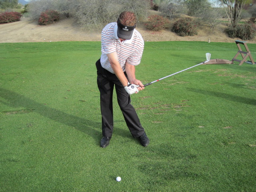 Keep hitting shots trying to maintain the spin angle through the downswing and through the impact zone! The shots will not only go farther but will feel more solid. Make a few baseball swings above he ground just above your waist line. This will allow you to feel how the club should release naturally. Then tee a ball up and make the same feel swing on the ball. Good contact will begin to happen. 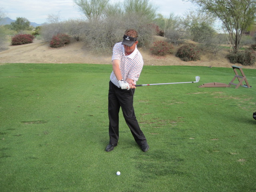 Remember that creating a good golf swing with a lot of power is not very far from a good baseball swing.